CIO writer and CB blogger Al Sacco lined up some great face to face time with RIM Executives at WES 2008 and during each interview consistently posed the simple question, What 3rd party apps are you running on your BlackBerry? 1. TeleNav - Top Notch GPS navigation software. A must-have for Heit. 2. Garmin GPS for BlackBerry - Also top notch, with over 6 million points of interest. 3. Pocket Express - All-around mobile companion. 4. WorldMate Live - If you travel as much as Heit and McDowell, you'll want this too. 5. Facebook for BlackBerry - Heit and Lazaridis both use it. 6. FlipSide Music Player - A favorite of Mike Lazaridis himself. 7. Viigo - McDowell and Lazaridis both use this popular app. Get it for Free. 8. Google Maps Mobile - All 3 Use It... "It's just a great implementation...I use it a Lot!" FlipSide Music Player - If RIM's co-CEO is using a 3rd party music player, that sort of confirms there is still work to be done when it comes to the native app. I wonder if we'll be seeing the native music player getting a more visual look like FlipSide or MiuTunes (I wonder if Mike has checked out MiuTunes yet?!) in the near future? one thing is for sure, with the hopefully-soon-to-be-released Bold packing such a stellar LCD display, it seems a shame to not be able to browse by cover art. If you've never tried FlipSide before, you can pick up a free trial in our ShopCrackBerry.com store. Viigo - I hope you guys are using the CrackBerry.com Branded Version! If you haven't checked it out, you can get it here, and if you're eager to get the improved version that's coming soon, be sure to sign up for the Viigo Project Tango Beta. 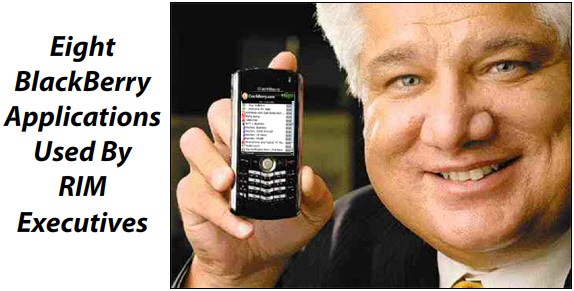 Facebook - I just searched Facebook for Mike Lazaridis and found 5 results, but none of them appeared to be Mr. BlackBerry. Darn, I was hoping to add him! If you guys like Facebook, definitely check out the BlackBerry PIN Exchange for Facebook. Over 25,000 BlackBerry users are tracking and trading their PINs with this app and it's growing daily!